Several changes have also been introduced to improve the horizontal equity of the tax system by providing relief to certain section of the society, in particular, senior citizens and the salaried tax payers, keeping in view their personal circumstances like health, fixed source of income and higher cost of incidental expenses relating to employment. These changes are discussed in the following paragraphs. At present, a deduction upto Rs 10,000/- is allowed under section 80TTA to an assessee in respect of interest income from savings account. 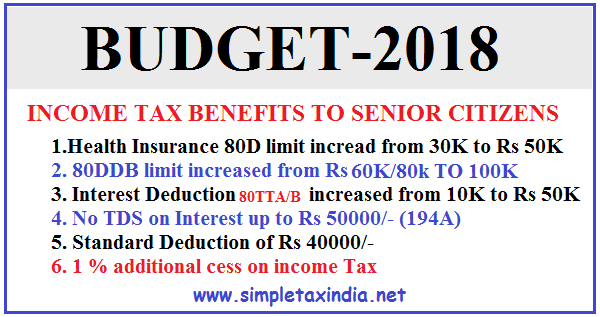 It is proposed to insert a new section 80TTB so as to allow a deduction upto Rs 50,000/- in respect of interest income from deposits held by senior citizens. However, no deduction under section 80TTA shall be allowed in these cases. This amendment will take effect from 1st April, 2019 and will, accordingly, apply in relation to the assessment year 2019-20 and subsequent assessment years. Finance Minister has proposed to allow a standard deduction of Rs. 40,000/- in lieu of the present exemption in respect of transport allowance and reimbursement of miscellaneous medical expenses. However, the transport allowance at enhanced rate shall continue to be available to differently-abled persons. Also, other medical reimbursement benefits in case of hospitalisation etc., for all employees shall continue. As no allowance is given after retirement so there is a clear cut benefit of Standard deduction to retired employees . However 1 % cess has been increased on Income tax which was earlier 3 % now raised to 4 % . It should be applicable weg 1st April 2018 instead of 2019. Please clarify.